I seem to have a lot of unfinished paintings that I’m feeling stuck with. So I took a pile of them and subjected them to the electric sander. Can’t say that they look much better but I quite liked this one. I added a dark purple “line”, toned down some of the white bits by applying magenta and ultramarine paint with my finger and also added some glass beads to the flower areas. I can’t remember what this painting started out like. I know at some point I added some tissue paper. 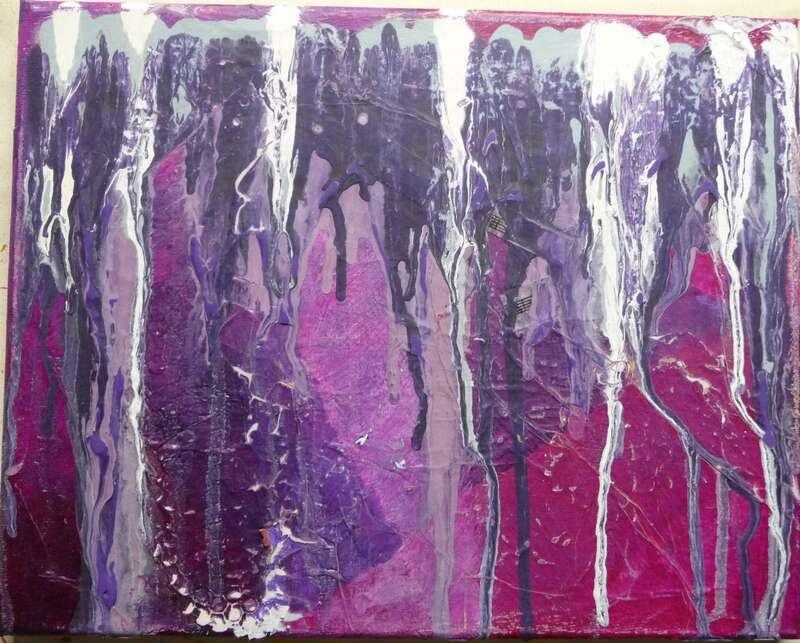 I also used it to experiment with paint dripping. Then it was abandoned and I regularly cleaned my brushes and other tools on it. Yesterday I used it to finish up some left over medium through punchinella and a flower stencil. Today, I took the sander to it and, da dah, I’ve got a painting I like. I think it might like good with a dark purple frame to match the “line” I added. What do you think – worth framing or a pig’s dinner? Vote Below! Thanks for your feedback and for voting. Since I wrote the post I’ve taken another photo with less glare so I’ll upload that when I’m on the right computer! I really like this – it would look wonderful in a bedroom with white walls and bedding and this adding the colour interest, for example!! Yes. It would. That’s a lovely idea! 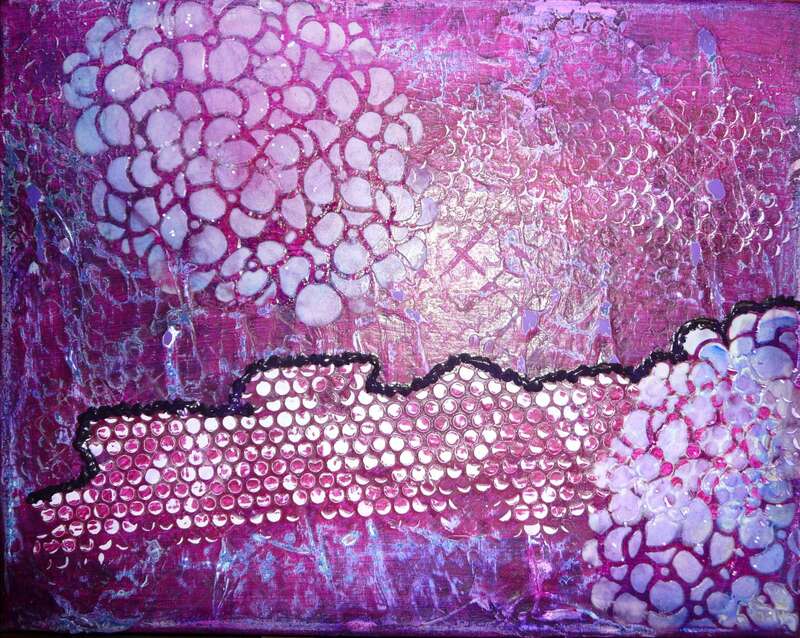 I like the color and variety of textures in this piece. Interesting technique! I have a few paintings I should try that with. Please come back and leave a link if you give it a go it would be lovely to see what you come up with. 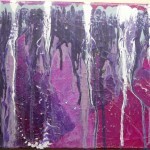 Love love love the purple and the texture is divine! HPPF! Yes. It’s interesting how time gives you a different perspective. I put it away for a couple of months and when I went back to look I found I really like this picture now. I’m definitely going to frame it. I love the textures and what Tracey said might work too!! Pretty and rich! Ultimately you are the only one that knows if it’s finished and you have to like it to as it expresses who you are!! Thanks Mary, Anne and Giggles for your lovely comments. I appreciate it!